Stephanie Brend :: Lane Enterprises, Inc.
Stephanie Brend started working for her parents, the owner/operators of seven McDonald’s in Wichita, when she was 13-years-old. She stayed in front of the counter, cleaning the lobby and helping with birthday parties until she was old enough to join the crew. 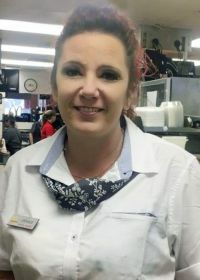 When she turned 17, she had another calling — working with juveniles — and after years of service in a challenging but rewarding profession, she returned to McDonald’s. Fast forward 14 years and she was back on the floor at McDonald’s. She started as the General Manager at the 13th and West St. and today is the GM in Goddard. Two or three months before Lane Enterprises took ownership of the Brend’s McDonald’s, her parents told her they were going to retire. Although she is no longer working for her parents, she says she is dedicated to McDonald’s and to her job. Stephanie and her team are working on becoming more customer-obsessed, and that will lead to faster, more accurate orders. They are also hiring a lot, so they are focusing on training new employees.